SJ's Longest Now is the thoughtstream of Sam Klein, wikipedian, educator, mathysphere, mesh maker. A designer on Electron: 0.5Mev… Proton: 1Gev… Higgs: 125Gev? Wikis : Information, communities, and feedback loops. Over the past year, in the US, Italy and other countries, Internet communities have flexed their muscles and demonstrated their popularity and capacity for organizing public opinion, by convincing lawmakers not to pass bills that would have made life difficult for ‘Net service providers and site owners. 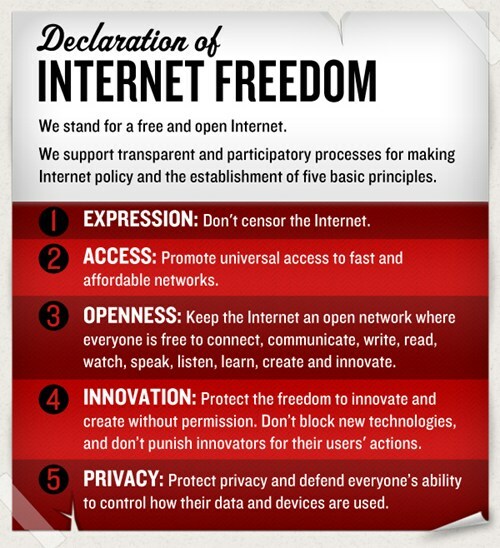 This week a more global network of organizations that strive for open access to knowledge and the Internet have published a “Declaration of Internet Freedom“, calling for governments and institutions and people everywhere to support a similar set of principles that support what we have come to think of as a free (and adaptable) Internet. I support that effort, as do the EFF, Public Knowledge, Free Press, and the Cheezburger empire. Even if the ‘declaration’ is more a proposition of principles to uphold. You can sign on to the declaration online. P.S. for an explanation of the subject, see this. How will YOU use 12M bibliographic records? Harvard Libraries recently released bibliodata from their collections – 12 million works in all – under a CC-0 license, which lets other sites and researchers reuse that data in any way possible. This is the biggest release of bibliographic data of its kind — four times the size of a similar release by the British Library in late 2010. (Without an explicit release under a free license, such collections of metadata are covered by ‘database rights‘).